Sohini Gupta, Anisha Srivastava, and Prioska Baruah perform a scintillating Assamese Jhumur dance. 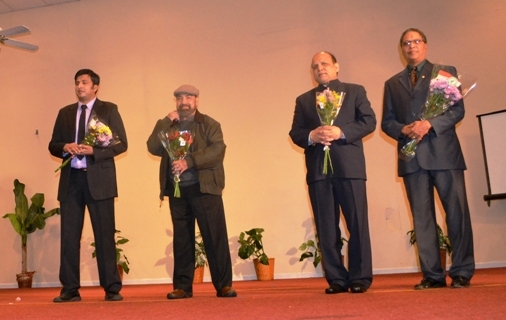 India American Cultural Association (IACA) celebrated India’s 65th Republic Day with guest speakers and an inspiring cultural program on January 26, 2014. Newly elected IACA President Nivedita Garabadu extended a warm welcome. She and BOD member Padma Rallapalli (in a tiranga salwar kamiz) performed swagatam (traditional welcome) ceremony for Hon. Rajinder Singh, Consul/Head of Chancery of the Consulate of India in Atlanta; Greg Pridgeon; and former IACA President Dr. Gauranga Banik. Guest speaker Anand Bhika; Surinder Pal Singh, grandson of Gadarite Bhagwan Singh Gyanee; Hon. Rajinder Singh; and Greg Prigeon at IACA's 65th Republic Day celebrations. The kids take a bow. Mohan Nair gave a brief talk on the history and significance of the Indian national flag, known as Tiranga (tri-color). Congressman David Scott (D-GA 13th District)'s message for the occasion was read. Thanks and refreshments followed and sent IACA friends away with promise of a good year to come!